The use of solar cells as a renewable alternative to energy generation is one of the most controversial topics nowadays. The goal of these photovoltaic devices is to meet worldwide energy demand which is mainly supplied by fossil fuels; however, materials and manufacturing costs related to this technology are high. On the other hand, synthesis and application of ecomaterials are trending topics because they lead to the design of new materials that can replace the conventional ones that have a higher environmental impact. Some solar cells use biodegradable materials or materials that can be recycled, which can be classified as ecomaterials. The use of ecomaterials in renewable energy technologies is crucial for the future of sustainability. 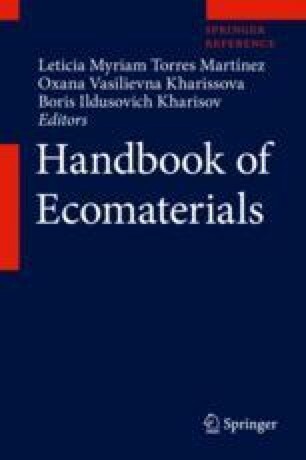 Ecomaterials can be classified in to materials with less hazardous substance, such as those used in dye-sensitized solar cells, materials with green environmental profile, such as the organic solar cells, materials of higher resources productivity in which plasmonic solar cells can be mentioned, and finally, materials of higher recyclability, such as the silicon of which the cells are mainly composed. The use of ecomaterials leads to the reconceptualization of the way the devices are designed. This chapter gives a different point of view of the design of solar cells, thinking about reducing the environmental impact and improving its performance at the same time.